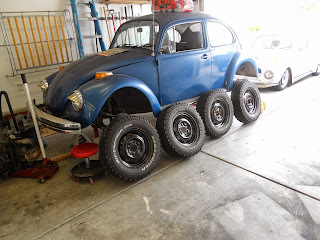 The Bug Boys: Air soft BB's to balance tires. Yep, I am going to try to run my tires with air soft beads to balance them instead of balancing them with weights. There are lots of advantages of running these beads instead of weights. They make beads that are specifically for balancing tires. One brand is called dyna beads. You can read about them if you want. I heard of using air soft BB's as an alternative method that is a lot cheaper and works just as well. I figured this is a good project to try this method. 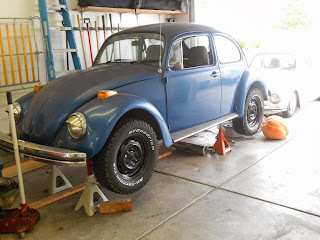 I have been wanting to try it for awhile now and I was going to do it on the last set of tires I bought for my other bug but Discount balanced them for free so I didn't. Anyways, keep reading to see what I did. I finally got some paint on my wheels and let them dry for a day before I mounted my tires on them.. Here are the tires I am going to run on my class 11 lookalike. 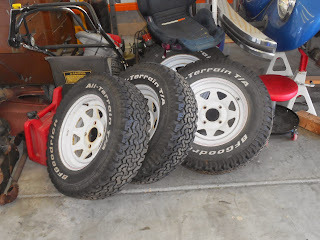 I took them to work and removed them from the baja wheels they are on. 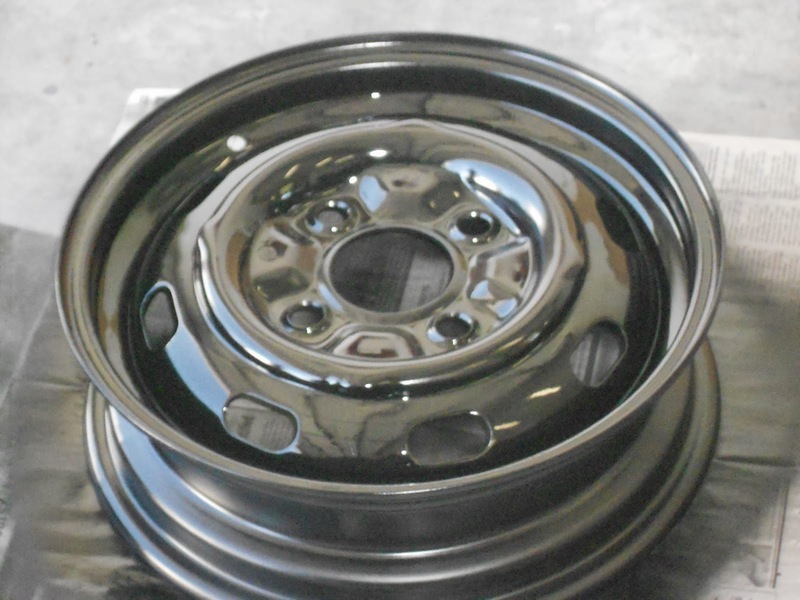 If you are looking for some good baja 4 lug steel wheels let me know. They are for sale! These are the beads that I went with. 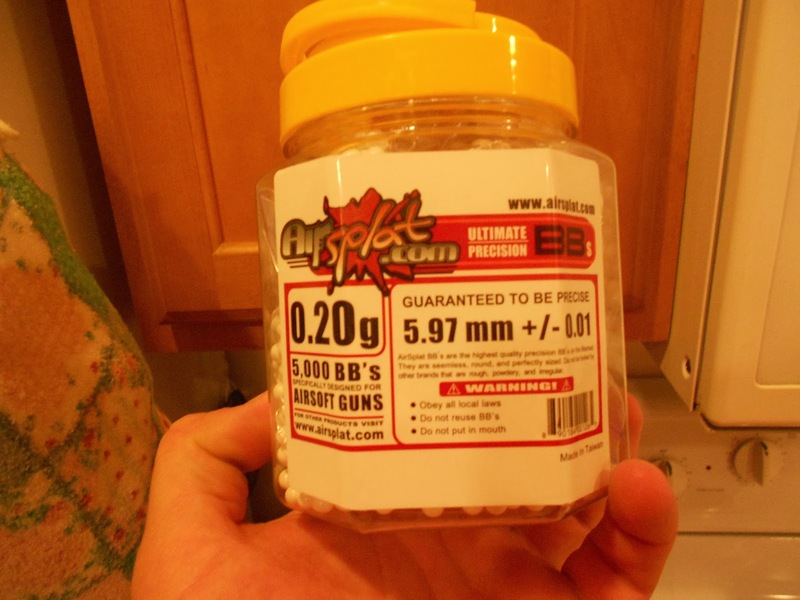 Get the heavy ones (.20g) I went with 5000 BB's and after weighing them out I have enough for 10 tires. This container cost me 20 bucks so that's only 2 bucks a tire to balance. You can get cheaper ones at wal mart or even cheaper ones on amazon. I went with these ones because they are suppose to hold up better and they were the only ones I saw that had a guaranteed tolerance on them. I figured they had to be good. I read that you want to measure out 3.5 ounces for each tire. I used a food scale and I ended up bagging 10 3.5 ounce bags with just a few left over. 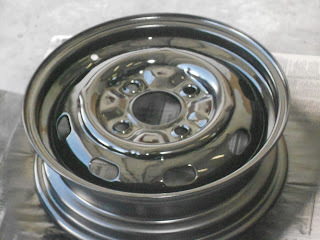 I then mounted the tires on my rims and just before I set the beads I poured the BB's into the tire. 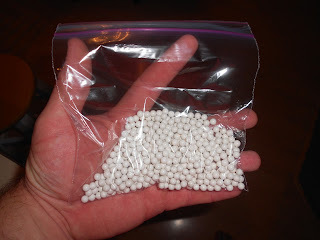 I then just pumped them up and set the bead. 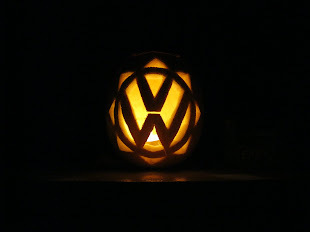 It was easy as pie. You can hear the beads rolling around in the tires. 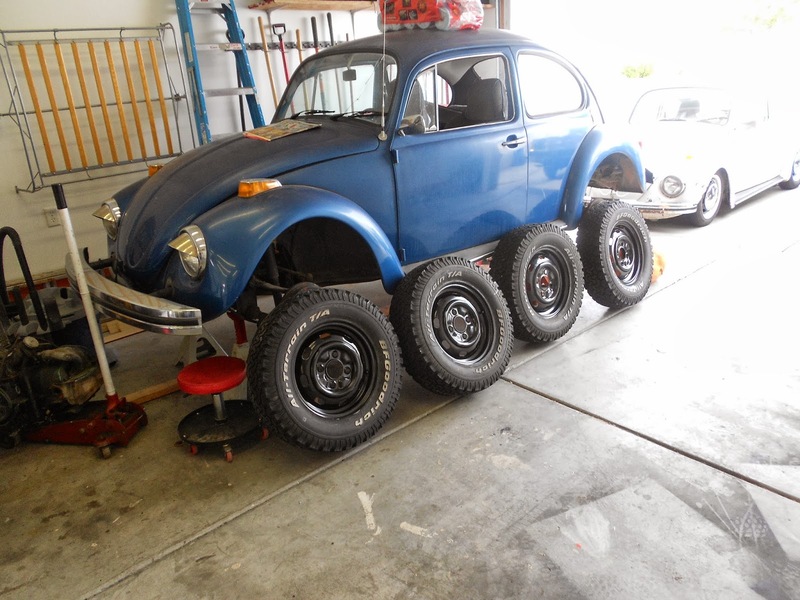 When I get my bug up and running I will post on how well they balance. I hear that guys that do a lot of mudding like using beads because they will balance the tires even with mud on them and as they shed the mud it will rebalance as it goes. Call me crazy but if it works I will save a ton of money because I can mount my own tires and I won't need to pay to have them balanced. 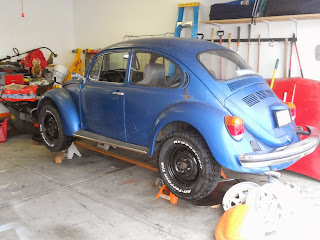 I go through tires on my lowered bug so it will help there also. Here are all 4 mounted and ready to go. I debated on whether to put the white letters out. In the end that's what I ended up doing. I couldn't resist putting them on to see how they look. I think that when I get the suspension set up the way I want, it will sit like this when it's on the ground. It actually might be a little higher. I will need to adjust the steering stops just a little so the tires don't rub on the torsion arms but other then that it should be good. 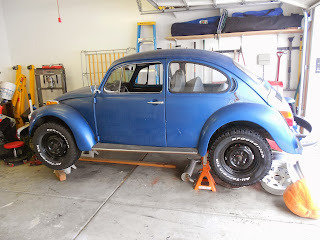 I will be able to start on the suspension when the raised spindles and the new ball joints get here. Hopefully that will be soon. I also need to re-index the rear suspension and notch the spring arms. 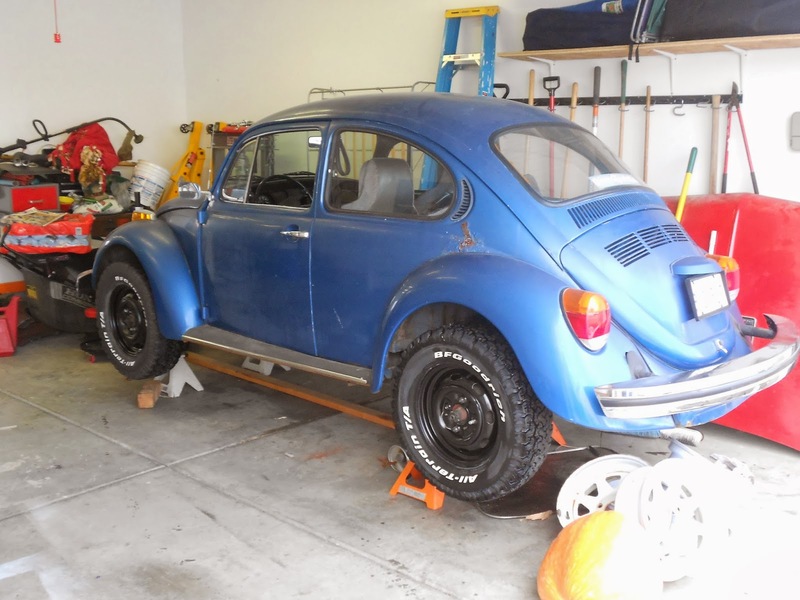 Hopefully we get it on the road before the first snow flies but time is not on our side. Check back to see if that happens and if the beads work. Until then, Keep on Buggin!